In all the works of God there is nothing that is worthless or insignificant. The smallest flower, a grain of dust, the tiniest insect, each and all reveal the wisdom, the omnipotence, the infinite greatness of their Creator, as clearly as the sun itself and all the glories of the starlit heavens. And thus it is with the Catholic religion; it has come forth, like the great world of nature, from the hands of God Himself; or, rather, it is that manifestation, that revelation, which God has made of Himself to the reasonable creatures whom He has deigned to create. And therefore we may discover, even in the smallest details of the faith we hold, a depth and beauty no less wonderful than the loveliness of nature; and in contemplating both we may truly exclaim, God alone could work such wonders; the finger of God is there! Let us take, for example, the Sign of the Cross, that simple religious act which is so universal and so frequently practised during the course of the day. We all make this holy sign, but how many of us give any thought to the mysteries it signifies! It is thus that the ox and the horse browse on the sweet flowers hidden in the meadow grass, unconscious that they are there. From want of reflection, we fail to attach to the Sign of the Cross the importance that it merits. It was first instituted by the Apostles themselves, who, invested with the authority of Jesus Christ, taught this religious practice to the first disciples of the Gospel. The Sign of the Cross is the sign of the Christian, that is to say, it is the outward sign which distinguishes the Christian from other men. And why is this? 1st. Because it recalls to him who makes it, and to those who see it made, that Jesus Christ is the God of Christians and the Lord of their whole lives. Because it reminds us that God has loved us so much as to give Himself up for our sakes to suffer on the Cross, and that we must love Him with our whole hearts. It places incessantly before our eyes Jesus Christ crucified; and Jesus crucified is the Divine and living rule of life to each one of His disciples, and His sacred Cross their moral law. The sign of the Cross recalls to him who makes it with reverence and devotion that he is bound to imitate in his daily conduct the penance, mortification, humility, meekness, patience, detachment, chastity, and obedience of his Master; His love for His heavenly Father and His Blessed Mother, and toward all men; His mercy to His enemies, and His love of suffering. 2nd. The Sign of the Cross is distinctively the sign of the Christian, because it reminds him of the blessed eternity which awaits him. It was after His passion and death that Jesus rose again. And by His Cross He entered into glory. And so it must be with His disciples. Their glory in heaven must be the full fruition of the crucified life they have led on earth, like unto the life of their Saviour. The Gospel also declares to us that when He shall come at the last day to judge the world, the sacred sign of the Cross shall appear in the heavens, to be recognized by the elect with thankfulness and love, and by the reprobate with fear and trembling; for then shall it be the disciples of the Cross, and none but they, whom He will acknowledge for His Own. 3rd. It is the sign of the Christian because it brings before his mind the most important doctrines of the Catholic religion. It recalls the mystery of the holy and undivided Trinity, for in making it we say, In the Name of the Father, and of the Son, and of the Holy Ghost; three persons, but one God. In the name; and not, In the names. And also the mystery of the Incarnation, that is to say, the coming down of the Son of God from Heaven to earth, to assume a body and soul like ours in the womb of the Blessed Virgin Mary; for, in saying "In the Name of the Son," we move the hand down from the forehead to the breast, a lively image of the annihilation of the Son of God, who reposes in the hearts of the faithful, as formerly in the chaste womb of Mary. And, again, the mystery of the Redemption, since it was upon the Cross He died to wash away our sins, to merit for us pardon and salvation, and to open the gates of Heaven which sin had closed. 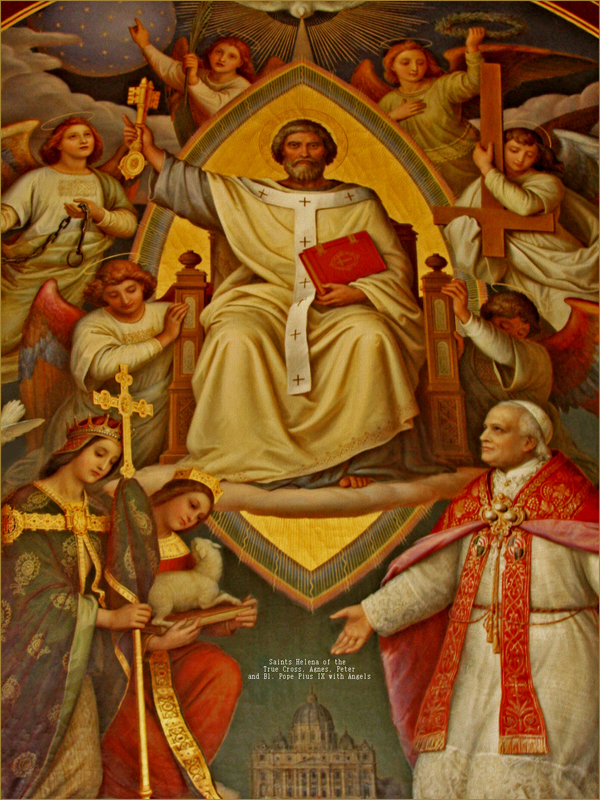 And the mystery of the Church of God, that great society of the disciples of Jesus Christ, that perfect union, holy, Catholic, and apostolic, of the children of the Cross; since, being the same for all, it is necessarily the sign of their union in one body under one head: a most distinctive mark of the Catholic Church, for it recalls by its unity that the Church is one, and by its universality that the Church is Catholic. In considering all that is symbolized by this sacred Sign, we may therefore clearly understand why it is employed by the Church in the administration of all holy things, in the Sacraments, in every blessing, at the beginning and end of her prayers. Let us make it often, but especially when tempted and when troubled; also before and after meals; and when we make it, let us be careful to remember what it signifies, and the obligations imposed on all who bear the holy name of Christians. The Sign of the Cross reminds us of the Blessed Trinity and that God the Son died on the Cross. It revives our faith with belief in the Unity and Trinity of God and the Incarnation and Redemption. It strengthens our hope by recalling that all blessings come through the Cross and by fostering a habit of seeking aid through the Cross. Finally, it nourishes our charity symbolized by fortitude in acting as soldiers of Christ and Patience in disciples of Christ. The Sign of the Cross is used in public worship. Some examples of this are the 50 times it is used during the Holy Sacrifice of the Mass [Traditional Roman Mass, not the Novus ordo, which eliminated most of them], at the beginning, end and during the Divine Office, in all Blessings by Bishops and Priests, in the administration of the Sacraments------such as 14 times in Baptism [Traditional Roman rite] and 17 times in Extreme Unction [not the Novus Ordo "Sacrament of the Sick"], and on everything blessed for the service of God, such as altars, linen, holy water, etc. The Sign of the Cross should always be used before our chief actions and undertakings in order to sanctify them and obtain God's blessing. Indulgences are given of 50 days for making the Sign of the Cross saying the words, and 100 days for the same when using holy water. [Changed to a simple partial indulgence, since 1968]. The Cross is used on the person as the badge of a Christian. Every society has its badge, such as a garter, ribbon or medal. It is found in Churches, houses and private rooms. It is found on Churches, schools and buildings as the ensign of the King who reigned from the Cross. Finally, the Cross is found throughout Christian art in order to sanctify it and make it minister to the glory of the Cross. The Sign of the Cross is a sacramental if we make it with the right hand by touching the forehead (showing our belief in the Cross), the breast (showing our love of the Cross), and the shoulders (showing our readiness to bear the Cross). Sometimes a triple Cross is made with the thumb for example at the reading of the Gospel. It is made on the forehead, on the heart, and on the lips in order to show our readiness to profess the Cross. Too much importance cannot be attached to the necessity of making this sacred Sign with reverence and devotion. Any Catholic who with love performs this simple act of piety will soon see its excellent effects, and we propose it to all as one of the easiest and most efficacious means of sanctifying the day. It is necessary to be very careful never to make the Sign of the Cross badly; that is, to make it from habit without thinking of it, and when laughing, or to make it in haste without taking the trouble to move the right hand from the forehead to the breast, and from the left shoulder, to the right. It is not necessary every time you cross yourself to say, "In the Name of the Father," etc. ; it is good and beneficial to repeat this invocation, but it is both useful and holy to cross yourself without saying anything. Nothing is more edifying than to see a Christian make the Sign of the Cross with care and reverence and in a truly Catholic spirit. The celebrated Pere de Ravignan always crossed himself with scrupulous care; anyone might see that he was proud to sign himself with the Cross of Christ. By this he preached even before preaching, and made a deep impression upon his hearers without having said a single word. A Protestant clergyman who went to hear him one day at Notre Dame said to his companion, after having seen the venerable religious sign himself with such holy and majestic gravity, "He has preached already; the sermon is finished and we might go." Parents and masters should carefully impress upon children this religious practice; and since children imitate all they see, fathers and mothers, masters and mistresses should begin by practising what they teach, and should always, both at home and at church, before and after work, before and after meals, make the Sign of the Cross like true and faithful Catholics. And now let me ask, have you felt a little conscience-----smitten while reading this chapter? How do you make the Sign of the Cross? Do you make it often during the day? Form now an earnest resolution to do all things in the spirit of faith, and never to make with indifference and distraction the sacred sign of Our Lord and Saviour Jesus Christ. 1. Nicephorus writes that S. John the Evangelist made upon himself the Sign of the Cross, before dying ----Hildian says S. Paul used the same Sign to restore sight to a blind man ----Many even affirm that Our Lord Himself taught this Sign to the Apostles, and that He used it to bless them on the day of His Ascension ----The Sign of the Cross, says S. Ignatius, disciple of S. John, is the trophy raised against the power of the prince of this world: When he sees it, he is afraid: when he even hears of it, he is filled with terror. ----Hautrieve. 2. S. Benedict was asked to govern a monatery where discipline was but badly observed: for a long time he resisted the entreaties of the monks, but being at length persuaded to undertake the charge, he did his best to introduce into the monastery the stict observance of the rule, but only succeeded in exciting against himself the hatred of certain wicked monks, who formed a plot to take away his life. They accordingly mixed poison with his drink, and brought it to him as he sat at the table with the rest of the community. S. Benedict, according to his custom, extended his hand to make over the glass the Sign of the Cross, and at the very moment when he formed the holy Sign, the glass, which was held at a little distance, was shattered to pieces, as if it had received a sudden blow from a stone, and a serpent came forth from it. ----His Life: March 21. 3. Though retired into the remote parts of a desert, S. Anthony often experienced the fiercest attacks of the devils: they would appear to him under a thousand frightful forms. The Saint laughed at their impotence, and to put them to flight, simply contented himself with making the Sign of the Cross, saying to his disciples: "Believe me, Satan fears prayer and humility and the love of Jesus Christ: the mere Sign of the Cross suffices to banish him." ----His Life: Jan. 17. 4. The Martyr S. Tiburtius, condemned under the Emperor Diocletian to walk through a blazing fire, made the Sign of the Cross over it, and walked over the burning coals without experiencing any injury. ---- His Life: Aug. 11. 5. After the death of the Emperor Julian the Apostate, there was a tremendous earthquake all over the East. The seas overflowed their bounds, as though they would have submerged the earth in another deluge. At the sight of these prodigies, the inhabitants of Epidaurus ----a small city of Greece ----ran to the cell of S. Hilarion, and with tears besought him to have pity on them, and come to their aid. They brought him to the seashore. There S. Hilarion knelt on the sand, prayed with fervour, and made the Sign of the Cross three times over the troubled waters. Immediately there was a dead calm. All the people of Epidaurus witnessed this miracle, and for long years after, they ceased not to remember it with gratitude. ----His Life: Oct. 21. 7. General Smith, of the army of the South, was coming in with his men too late to know the password. Knowing that if he went forward he would receive the fire of his own side, he presented himself before his men, and asked if anyone would sacrifice his life to save the rest. A soldier stood out of the ranks: after explaining the certain danger he would have to face, the General gave him a piece of paper, on which were written these words: "Send me the password. Genl. Smith." He knew the soldier would be shot, and then searched, and thus the paper would be found, and read, and the sign made known. The soldier sets out, and reaches the outposts: "Who goes there?" "A friend." "The word or sign?" But the soldier advances without reply, and at once the rifles all raised and pointed at him. He thereupon makes on himself the Sign of the Cross, and to his surprise the rifles are lowered. The act of the Catholic soldier, in commending himself to God, was the very sign the Catholic Commander had that very morning given to the army. ----Toulemont. 10. The Emperor Maximian wishing to know the future, caused victims to be immolated, and searched in the entrails for some token of events to come. Some Christian soldiers happened to be present, and made on themselves the Sign of the Cross. Immediately the devils took to flight, and the sacrifice was deprived of its results. Fresh victims were offered, but without better success. ----Lactantius. 11. Julian the Apostate one day entered a pagan temple, in company with a noted idolater. The latter having invoked the demons, they at once made their appearance: Julian became alarmed; and forgeting, for a moment, that he had abjured the Catholic religion, he made the Sign of the Cross, as he had been formerly accustomed to do when any danger was near. Immediately the infernal spirits disappeared ----so powerful and efficacious was this Sign, when made even by a Christian renegade! This miracle was the last effort of Divine mercy to recall that wretched being to repentance; but the unhappy man's heart was hardened and insensible to every call of God. ----S. Gregory of Nazianzen. 12. S. Augustine, whom no one will suspect of credulity or weakmindedness, tells of a woman of Carthage, afflicted with a cancer, which the physicians had declared incurable. Despairing of the efforts of men, she had recourse to God, Who made known to her that she was to present herself on Easter Eve before the newly Baptized catecpumens in the women's baptistery, and request one of them to make the Sign of the Cross over her cancer: this she did and was immediately cured, to the surprise and astonishment of her physician. 13. A lady of religious education and pious life one day found herself seated at a table next to a young officer. Her first care was to say grace, with the Sign of the Cross. "Ah, madam, what is that?" said the officer, in a tone of irony. "Captain," she replied, "are you ashamed of your cross of honour?" "Certainly not." "Then know that the Sign of the Cross is to me a sign of honour and glory." The company could not but approve of her words and acts, and the officer could only stumble out some lame apology and excuse. ----Fliche. 14. Fr. Ravignan always made the Sign of the Cross with scrupulous care and devotion. A Protestant minister went one day to hear him in Notre Dame, in Paris. Seeing the venerable Father make the Sign of the Cross with such holy and majestic gravity, he said to his companion: "He has already preached to us; the sermon is over, we can go. ----His Life. 15. The Emperor Heraclius having brought to Jerusalem the precious relic of the Cross (which had been discovered by S. Helen some years before), in order to thank God for his victories over the Persians, was desirous to carry it upon his own shoulders into the city with the greatest pomp. When entering the city he stopped suddenly, and found he was not able to go forward. The Patriarch Zachary, who walked by his side, suggested to him that his pomp seemed not agreeable to the humble appearance which Christ made, when He bore His Cross through the streets of that city: "You," said he, "walk in your gaudy imperial robes; He was meanly clad. You have on your head a rich diadem; He was crowned with a wreath of thorns. You go with your shoes on; He walked barefoot." Hereupon the Emperor laid aside his purple and his crown, put on mean clothes, went along barefoot with the procession, and devoutly placed the Cross where it stood before. It still continued in the silver case in which it had been carried away by Chrosroes fifteen years before; and the Patriarch and clergy, finding the seals whole, opened the case with the key, venerated it, and showed it to the people. ----Power.